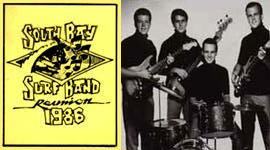 Bob Dalley introduces PJ and the Galaxies at the 1986 South Bay Surf Band Reunion. Tt say that they were heavily influenced by the Belairs is an understatement. When Paul replaced Tom in the Galaxies, he said it was really eerie - like he'd always been in the band. They new every nuance of his material. The line up here is Paul Johnson - guitar, Skip Hand (Handful Of Fives, Eddie & the Showmen) - drums, Jim Boyle (Eddie & the Showmen) - guitar, Steve Pugh (Packards) - bass. This is a really rhythmic tune, and P. J. & the Galaxies play it toned down and delicate. Excellent arrangement of a PJ standard. Yahoo! "Windshield Wiper" is a slow and rhythmic piece that hints of the islands. This arrangement is faster than the 1980 Packards arrangement, which is more fitting. It plods along with a grin and a melodic riff. very fine. "Scouse" is slang for "Lobscouse," a type of fisherman's stew. Paul Johnson wrote this in response to the British Invasion. It's melodic and rhythmic. Very cool. This Shadows tune is quite cooly delivered. The mid tempo, perfect drums, and fun melody line all work together here. The chunk-chop of Jim Boyle's rhythm guitar are primary in it's holding together. Excellent. One of Paul Johnson's most infectious rhythm dominated originals is played well. I can't say I've heard a bad version of this. Originally issued as a B-side (hence the name), this is a fun and happy tune, enhanced by the use of Tiny Schnieder's cow bell.